Fixed Dividers: NET Distance between EACH divider is 22 mm, giving enough space to hold any devices or tablets even with thick case. and meet the essential requirements to be circulated within the community. USB Charging Station for Multiple Devices: Works as both APPLE products charging station and Android devices charging station, JZBRAIN USB Charging Station compatible with Apple products apple watch iPhone X 8 7 7s 6 6s 5 5s plus iPad iPod, airpods, iwatch, kindle, MacBook pro, etc. Android devise like PDA, Samsung Galaxy tab, HTC One Plus, Nokia, Sony, Motorola, Fitbit,Pebbles Smart Watch, etc. No Dividers Fall Down mess: Fixed dividers keep big enough space (net 22mm) for cell phone or tablets like iPad, real iPhone charging station, real ipad charging station, real phone charging station, real android charging station, real multi charging station, no mess like other so-called detachable dividers usb charging station the dividers always fall down that may make you mad and finally throw it as rubbish. Charging Docking Station Organizer: This recharging station has built-in Intelligent Chip that will identify connected usb devices and supply demanding current, bluetooth speaker, PS3 PS4 Remote Controller, Samsung Fit Gear, Samsung galaxy S3 S4 S5 S6 S7 edge J7 note S8 plus cell phone electronic gadgets charging station, etc. surge protector was also built in. Base of this usb charger station is made of ALUMINUM: Different from other plastic base charger station became hot after hours recharging, JZBRAIN 4 usb charger station has much better performance on heat releasing even 40W full loaded, moreover aluminum base looks modern and environmental, you will never be disappointed when you get it in hand. You expected USB Charging Station Organizer: This multiple usb charger each port reaches 5V 2.4A, 4 port Total 40W, super fast charging station better than other similar cell phone charger station. 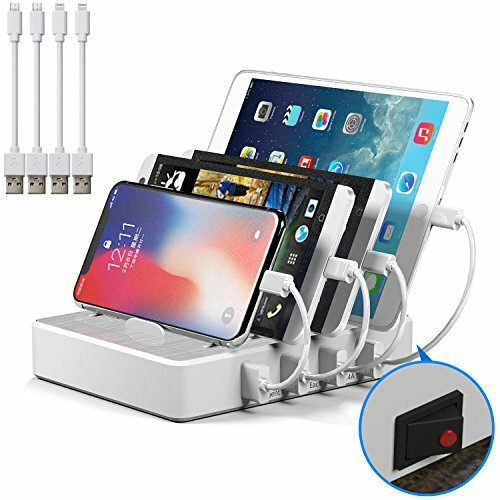 Delivered with 4 short cables are included in the package for multiple devices, 10 dollars cheaper than other charging dock station without cables, also good charging cord organizer, reduces clutter and makes space saving, clean and tidy, you will like this phone charging station for women, man, kids. If you have any questions about this product by JZBRAIN, contact us by completing and submitting the form below. If you are looking for a specif part number, please include it with your message.